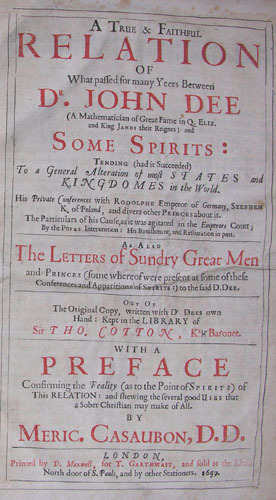 A true & faithful relation of what passed for many yeers between Dr John Dee ... and some spirits (London, 1659). John Dee was, and remains, one of the College's most infamous and intriguing alumni. He proceeded BA from St John’s in 1545 and became a Fellow of the College before moving to Trinity as one of its original Fellows in 1546. A polymath and humanist who wrote over 80 scholarly works and was involved in calendar reform, providing medical and legal advice to Elizabeth I, describing comets and drawing up geographical descriptions of newly explored territories, he is also remembered for practising astrology and communicating with spirits. 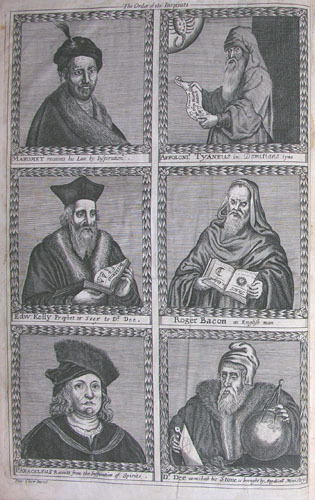 Elizabeth herself employed him to calculate the most propitious date for her coronation, but the most celebrated events occurred when Dee left England for Bohemia rather mysteriously in 1583 and during his progress through central Europe teamed up with an alchemist named Edward Kelly (pictured middle left of the frontispiece, along with Dee who is bottom right). Together they performed a series consultations with spirits, which Dee recorded in his Liber mysteriorum. This first edition of selections from the Liber mysteriorum must have contributed to the strength of this strand in his subsequent reputation. It was published by the scholar Meric Casaubon over 50 years after Dee's death, with a polemical preface against those who were unpersuaded of the existence of witches and evil spirits, and the intent of using Dee's text as evidence of such entities.